Business majors Vanissa Hernandez, Sandhya Kodippily and Danny Vongkhamchah won third place in the Elevator Pitch competition (Robert Bain photo). The Student Union was buzzing with confidence Dec. 6 as students rivaled for top prizes at the 2012 Silicon Valley Innovation Challenge. Only the cream of the crop made it to the poster and elevator pitch competitions this year because all entrants were pre-screened online. “Through the use of social media, we were able to build a community of 1,200 members from all over the world,” Silicon Valley Center for Entrepreneurship Director Anu Basu said. Judges selected forty-seven finalists from more than 250 submissions from all seven SJSU colleges and, for the very first time, West Valley College and Mission College. Cash prizes ranged from $1,500 for Best Innovative Idea to $500 for the top elevator pitch. Partners and sponsors include Bridge Bank, Cisco, TechShop and Signature Building Maintenance. Many entrants focused on highly technical topics, such as Brandon Schlinker, Stephanie Fung and Phil Cyrthe, who took the top prize with “Smart Bulb,” a lighting system that adapts to your needs. 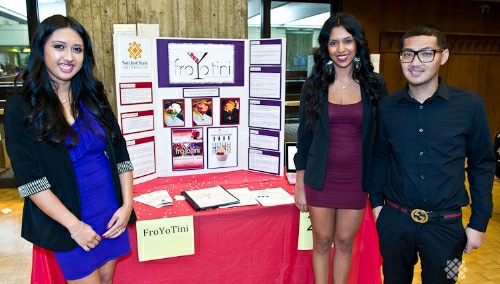 But among the ideas wowing the poster session’s 400 attendees and judges was third place elevator pitch winner “Froyotini.” You got that right — it’s a combination of frozen yogurt and your favorite mixed drink, plus toppings. Business majors Vanissa Hernandez, Sandhya Kodippily and Danny Vongkhamchah pitched the idea, which was of course an instant hit with the student crowd. “We brought a lot of color and glitz and glam and we do appeal to Generation Y through the Las Vegas beauty and glamor,” Hernandez said. To help students outsmart bike thieves, economics major Roy Vera came up with MyCycle, which uses NFC (Near Field Communications). The bike only works when the owner’s in the saddle, carrying a special device embedded in many cell phones that communicates with a receiver in the bike itself, unlocking the chain and wheels. So a thief can take the bike, but can’t peddle away without the phone that goes with it. 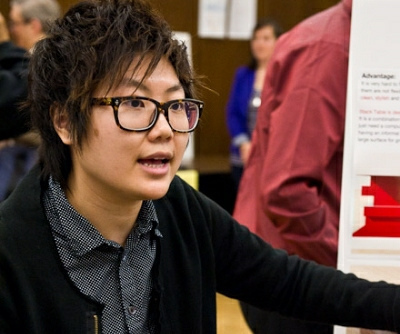 Vera received a “special mention” from judges for his idea. View a complete list of this year’s Silicon Valley Innovation Challenge winners.